He says "Toronto elites" want to expel PC memberships based on race. Conservative MP Alexander Nuttall speaks in the House of Commons Feb. 18, 2016. A Conservative MP is describing the downfall of former Ontario Progressive Conservative leader Patrick Brown as an "inside job," and accusing "Toronto elites" in the party of seeking to expel memberships based on race in order to consolidate power. 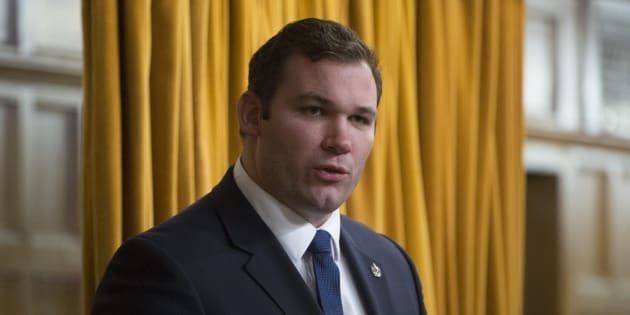 Alex Nuttall, who has represented the federal riding of Barrie—Springwater—Oro-Medonte since 2015, made the charges to reporters on Parliament Hill Wednesday. The remarks further highlight deep divisions in the provincial party. Nuttall was a key ally of Brown's and worked on his leadership campaign in 2015. After Brown's resignation last week amid sexual misconduct allegations, Nuttall said in a statement that "sexual misconduct and sexual harassment have no place in Canadian society, especially within our political system." On Wednesday, however, Nuttall blasted how 28 PC MPPs appointed Vic Fedeli interim leader last week and initially recommended that he lead the party into a provincial election that is mere months away. Fedeli announced Tuesday he will not seek the job permanently, but will work to "root out the rot" in the party. He promised to conduct a review of the party's membership rolls, including names, addresses and computer IP addresses used by members to register. "There is an overarching issue of these memberships that have caused me to ask for a complete analysis, a technical analysis, right down into the IP addresses where these came from ... It's going to expose things, I'm sure,'' he said. The interim leader also ordered an overhaul of the party's membership management system, which was hacked in early November. While Brown boasted earlier this month that the PC membership has swelled to more than 200,000 from roughly 10,000 in 2014, questions have been raised about his figures now that they take on heightened importance in the context of a quick leadership contest. The National Post reported Tuesday that there are "strong doubts" in the party that the 200,000 figure is "close to accurate." Nuttall suggested that the initial push to make Fedeli leader amounted to a power grab. "Within 48 hours of the events, we had 28 elites, whose ridings represent less than one per cent of the 200,000 members of the PC Party of Ontario, try to appoint the next (leader), circumventing democracy," Nuttall said, adding that they did so without the "moral authority" of the membership. "Now today what we've seen is they've doubled down, seeking to expel tens of thousands of paid memberships of the PC Party of Ontario. Well, folks, I have a message for the Toronto elites and it is this: that the Conservative movement should never and can never define people by their race, by their faith, by what region of the world that they come from, by their first or last name," he said. The Ontario PC caucus currently has one member from Toronto: Scarborough-Rouge River's Raymond Cho. Fedeli, meanwhile, represents the northeastern Ontario riding of Nipissing. Nuttall added that "the elites in Toronto need to stop making decisions in their own best interest to seek power," and think of what's best for Ontarians. "And the best interest of the people of Ontario is a strong and united PC Party, not one that is turning on itself in the public, daily," he said. Nuttall also said he would not be running for Ontario PC leader. He walked away before reporters could ask him questions. HuffPost Canada has reached out to Fedeli and new PC party president Jag Badwal to respond to Nuttall's claims. Badwall was appointed to the role Monday to replace former Tory MP Rick Dykstra, who resigned hours before a Maclean's report in which a woman alleged he sexually assaulted her in 2014. Ontario Tories will pick a new leader by March 24. Former Toronto city councillor Doug Ford launched his campaign this week by blasting the so-called elites. "The elites of this party, the ones who shut out the grassroots, do not want me in this race,'' he said. Lawyer and finance executive Caroline Mulroney and former Postmedia executive Rod Phillips are both being touted as possible leadership contenders, as is former MPP Christine Elliott, who finished second to Brown in 2015. MP Erin O'Toole, who ran for the federal Tory leadership last year, told reporters Wednesday that he isn't ruling out making a bid, CBC reports.